Joy Group, is a NGO, which was started in 2009, which identified the need to bring donors closer to the needy. After its initial years of achieving several charity projects, Joy group decided to introduce the concept of “Sustainable” charity. i.e, an act of charity with a long lasting impact. The idea was to provide “means” to the needy rather than “ends”. Thus was born “Pankh” handicrafts. The concept of Pankh (a social enterprise) is based on providing skills to unskilled or needy women & men, and a platform to apply the skills thus attained – thereby providing them with means to make an income rather than a one-time monetary help. The people at “Pankh” make the handicrafts and the products are then sold on the open market with the help of the Pankh committee. Since its inception, Pankh already has trained 6 women from Belgaum and Chikodi participating in the venture. In addition, Pankh has also partnered with Kiddy-Pack, a French NGO. The objective of ‘Kiddy Pack’ is to distribute school supplies and toys to under privileged children living in developing countries. KiddyPack places orders with Pankh to produce hand-made school bags / pouches / mats and napkins. Later, these supplies are distributed among identified target schools. This way, the incoming money gives jobs to Pankh employees to produce the handicrafts in addition to the final goal of helping the children with the school supplies. Double virtuous!! 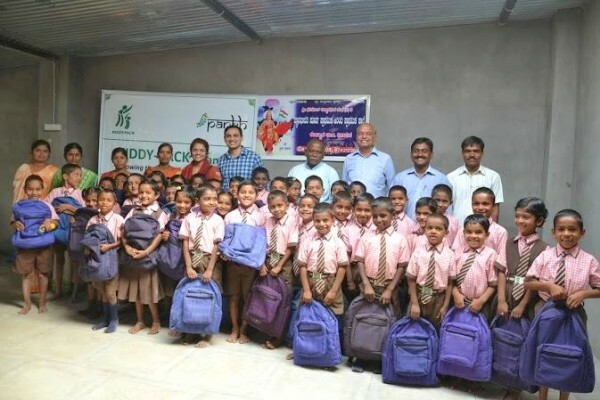 Currently, they are working to provide such supplies to more than 150 children in and around Belgaum. Please, find out more information on our French NGO by visiting our website (www.kiddy-pack.e-monsite.com) and by following us on Facebook. We are working on 2 other projects with our partner Pankh (schools in Belgaum and Kumbakonam), and on the possibility to distribute some toys to kids living in an orphanage in Mumbai. good one.. keep up pankh…! very much Happy by looking into your work. this will help to improve social condition of poor people…..